With the release of the new Movie Edit Pro, MAGIX brings a software to the market that has been designed completely to customer feedback. New features include up to 5X faster video editing, smoother display for up to 4K resolution and a comprehensive range of effects. September, 2017 – The brand new version of Movie Edit Pro is the result of close cooperation between MAGIX developers and Movie Edit Pro customers. Listening to customer feedback, the most sought-after requests including faster speed and smoother previews, even for high-resolution 4K videos, has been incorporated. The effects area is now also perfectly synced to the user's workflow and can be customized using the new, integrated Store. Ongoing collaboration with customers will continue to be reflected in forthcoming updates, which are included for free to customers who have bought the new version, thanks to the MAGIX Update Service. INTEL GPU hardware acceleration has been activated in Movie Edit Pro. As a result, editing video material can now be completed 5X faster than in the previous version. Even hi-res material up to 4K now plays smoothly on your preview monitor! The most sought-after customer request for smoother, more stable video editing has now been made possible thanks to cooperation between MAGIX and Intel. Intros/outros, transitions, film templates and now soundtracks are available to users in a quantity and quality that's never been seen before. In the new Movie Edit Pro Store, users can expand their selection of effects already available in the program. The effects areas itself has been redesigned in an aesthetically pleasing, clearly laid-out tile format. All effects can be accessed with a single click, making video editing even easier and faster than ever before. A coupon worth up to € 49,95 / $49.95 / £39.95 in value for five effects is included in Plus and Premium program versions. Users can now work with 4 of the most-requested plug-ins: NewBlue ColorFast 2, NewBlue Elements Overlay, iZotope RX Elements & HitFilm Movie Essentials. The latest effect plug-ins are included in the Premium version and are available in the two other versions at a special price. Also included are picture-in-picture effects, split screens, high-quality sound optimization and original film effects. Movie Edit Pro also provides a unique and complete solution for optimizing 360° recordings. The latest features such as 360° stitching and 360° perspective rotation complete the comprehensive set of 360° features with 360° effects and 360° to 2D cutout animation. With the purchase of the latest Movie Edit Pro version, users will also receive forthcoming feature updates for free. New features available in November: Discover total freedom in the Timeline! Tracks can be customized to the user's needs at any time, enabling a simpler, more flexible video editing workflow. Another feature to be released in November designed in line with customer feedback is the chroma keying feature, which is now significantly more user-friendly. The new version of Movie Edit Pro is now available online and in stores worldwide. MAGIX Movie Edit Pro 2018 is the next generation of video editing: faster, better and even more powerful than ever before! The software provides everything you need to design your movies. MAGIX Movie Edit Pro 2018 also offers high-quality special effects, cinematic transitions and templates, Full 4K Ultra HD, Full Stereo3D and Full HD support (for HDV and AVCHD camcorders), advanced dubbing (Dolby Digital 5.1 mixer, etc. ), 99 tracks, MultiCam editing, travel route animation, etc. Automatic wizards for video editing, audio dubbing and image optimization make the video editing process easier and more fun than ever before. Save videos and photos securely in the Cloud. This enables you to access photos and videos from anywhere – directly from MAGIX Movie Edit Pro 2018 as well. For the first time, access a selection of premium soundtrack music directly in MAGIX Movie Edit Pro 2018. There are 32 soundtracks and 22 sound effect packs! 20 songs and 2 sound effect packs are included for free. With MAGIX Movie Edit Pro 2018 you can apply video effects (brightness, contrast, color, artistic filters, distortion, sharpness). Furthermore, movement effects (size and position, section, camera and zoom, rotation and mirror, 3D distortion), audio effects (amplifier, distortion, echo, reverb, stereo splitter). Also design elements (picture-in-picture, collages, color swatch, backgrounds, image objects, intros and outros). In addition, you can create presets and install plugins for additional effects. Creative design: Special effects, transitions, intros and outros, etc. Practical color correction. Set the white balance, contrast and colors retroactively. Thanks to flexible track handling, tracks can now freely be re-sorted, deleted or added. With the new target track, you can add videos, effects & music to any desired location, saving you a lot of time. The new CPU acceleration rounds it all off and lets you work with Movie Edit Pro much faster. 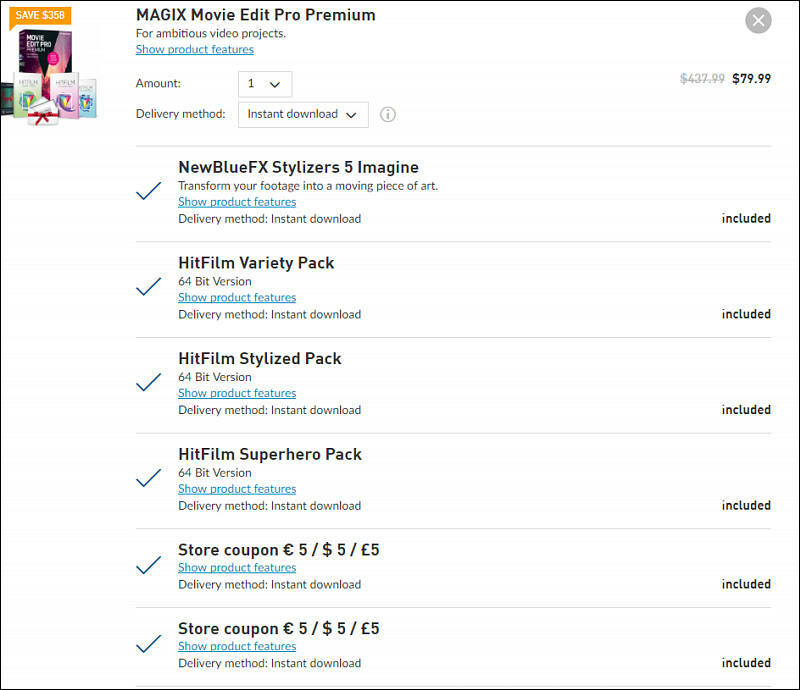 For everybody who now purchases the new Movie Edit Pro Plus & Premium, there are 5 effect coupons included the new version worth up to 49.95€ (each? in total? ), which you can use in the In-App shop. Resolved performance issue with the effect speed "reverse"